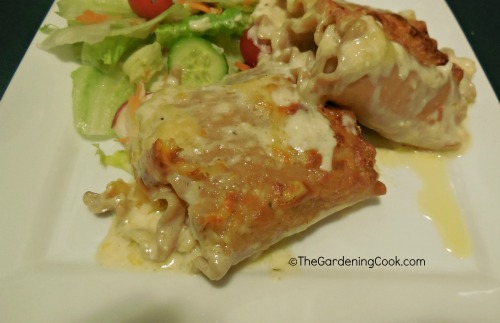 Ah….the richness and creaminess of Alfredo sauce combined with shredded chicken and then rolled up in lasagna noodles. This Chicken Alfredo lasagna roll up recipe will delight the most picky food critic. 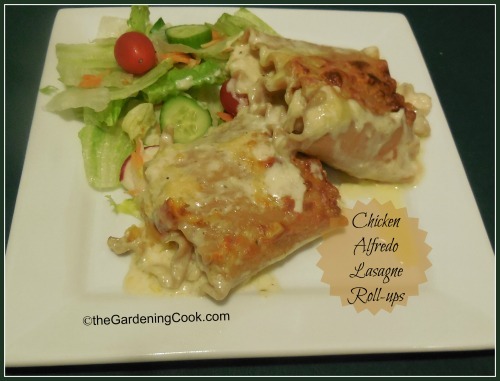 The recipe uses the idea of a traditional lasagna Alfredo dish but takes it to a new level with the individual portions in a roll up. Easy to serve and lovely to look at on the plate. I lighted it up a little (as much as you can lighten up Alfredo!) by using reduced fat cream cheese, 2% milk, and light butter. To make the roll ups. Start by boiling the noodles until al dente. Then make the Alfredo sauce. 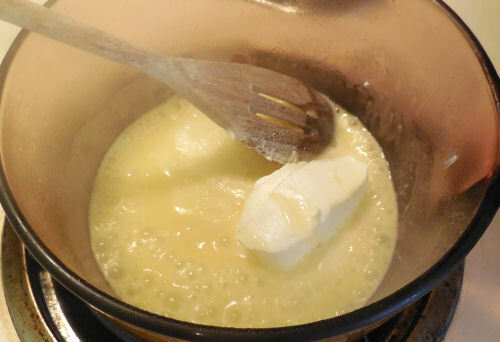 Combine the butter, garlic and cream cheese over a medium low heat until combined. Add the Parmesan, and shredded cheese,2% milk salt, pepper and oregano. Still until well blended and continue whisking for about 15 minutes until the sauce thickens. 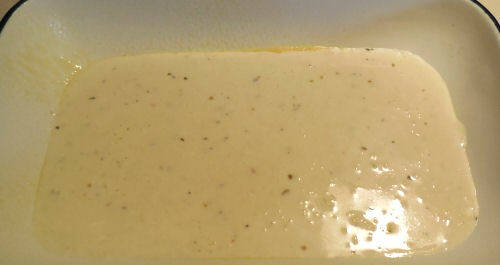 Spoon about 1/4 cup of the sauce in your baking dish. Place a bit of the Alfredo sauce on each noodle. 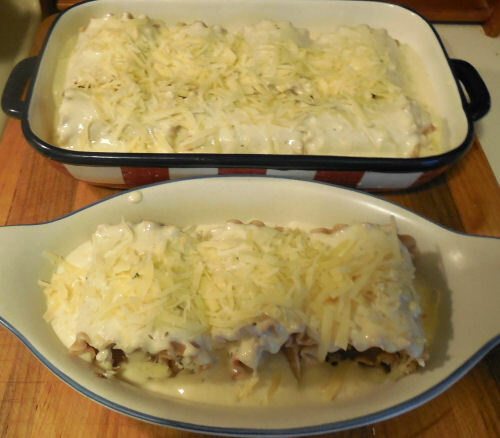 Top with diced chicken, another teaspoon of the sauce and a bit of cheese. 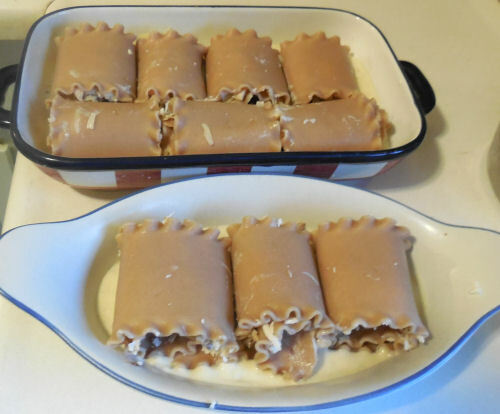 Gently roll them up and place on the Alfredo sauce in the baking dish. Spoon over the rest of the Alfredo sauce and the last of the shredded cheese. Bake for 30 minutes at 350 º F until the cheese is bubbly. Serve with garlic bread and a tossed salad and you have a great, and hearty meal that you will want to make again and again. Ah....the richness and creaminess of Alfredo sauce combined with shredded chicken and then rolled up in lasagna noodles. This Chicken Alfredo lasagna roll up recipe will delight the most picky food critic. Cook the lasagna noodles according to package directions until they are al dente. Drain and rinse the noodles with cold water and lay them on a paper towel to remove the excess water. Add the fresh minced garlic and cook for about 1 minute. Stir in the cream cheese and whisk until smooth. Add in the 2% milk. Season with the salt, pepper and oregano. Add 2 cups of Jarlsberg cheese and the Parmesan cheese. Bring to a simmer and whisk frequently until the sauce thickens - about 15 minutes. Spray an 8×8 pan with Pam cooking spray and spread about 1/4 cup of the Alfredo sauce over the bottom of the pan. Spread 1 tsp of the Alfredo sauce over each noodle. Take some of the shredded chicken and spread it evenly over each noodle and top with another tsp of sauce about 2 Tbsp shredded Jarslberg cheese. Carefully roll up each lasagna noodle and place the seam side down in the baking dish on top of the Alfredo sauce. 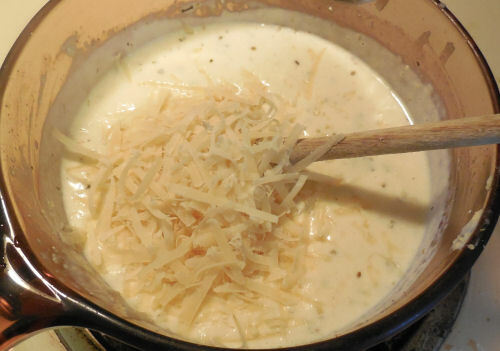 Once the roll ups are all in the pan, pour the remaining Alfredo sauce over the top and top with more shredded Jarlsberg cheese. Bake at 350º F for about 30 minutes until heated through and cheese is bubbly. Serve with a tossed salad and garlic bread.